I am pleased to present Garrigues’ Integrated Report, which provides a balanced view of the firm’s performance in 2017, sets out the most salient aspects affecting its progress and presents the main areas of work for the coming years. 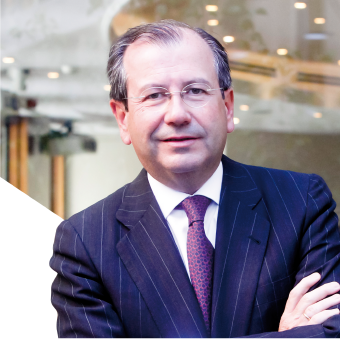 Innovation, talent and sustainability are the words that best define Garrigues at this moment in time, a challenging period in which the legal services industry is undergoing unprecedented changes due to digitalization and other factors. Innovation imbues everything we do at the firm in order to deliver greater value to our clients. Innovation at Garrigues is at its height, driven by digitalization, the needs of our clients and the transformation of society, not to mention the innovative spirit for which the firm’s professionals have always been known. This is reflected in initiatives that explore new ways of thinking and working (Innovation Think Tank) and the use of artificial intelligence ([email protected]), which you will read about in this report. This has been possible thanks to the talent of our professionals. In a law firm like ours, attracting and retaining talent has played and will always play a vital role. We have a global team, with a shared corporate culture, of more than 2,000 people of 23 different nationalities. We promote equal opportunities and merit-based promotions and we encourage training and lifelong learning. We have the best team and will continue to build it up over the next few years, with greater diversity, digital skills and new ways of working. Against this backdrop, a commitment to sustainability in its broadest sense is an obligation. We are very aware of what we receive from society as a firm and our intention is to further economic and social progress and to serve the public interest in the countries in which we provide our legal and tax advisory services, by contributing our knowledge of the law. Placing our clients at the center of our strategy, Garrigues is committed to earning its leading position in the main areas of business law every day, with a team dedicated to delivering added value to clients and the most innovative solutions in an ever-changing world. Thanks to this commitment and to the trust placed in us by many of the leading companies in the markets we operate in today, we are a firm of choice in Spain, Europe and Latin America. Our resolve is not to sit back but to strive for excellence each and every day. I trust this 2017 Integrated Report will help you to get to know Garrigues better.